These wristwarmers match my beret! 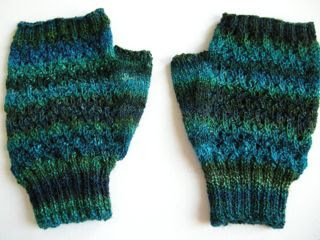 I made them on #0 dpns, and cast on 64 stitches around, just like socks! The yarn is a luscious color called Scottish Lichen from Interlacements, and it is a merino/silk blend which I spun up a few years ago. My spinning leaves a lot to be desired and is quite inconsistent. I got about 18-22 wraps per inch depending on where I measured. Sigh. 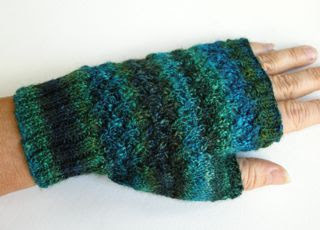 I made these to wear inside when it gets cold. 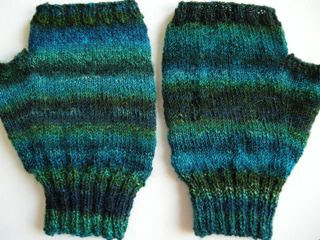 The pictures above show the front and the back of the mitts. I have another skein of this yarn, and it is spun even finer. I'm thinking that I may knit some socks. The silk makes it quite strong.